Cut the sweet dried bean curd sheet into medium strips, and fry in 1 tbsp of the oil until crisp. Remove and set aside. Soak the lily buds in water, then drain. Trim off the hard edges. 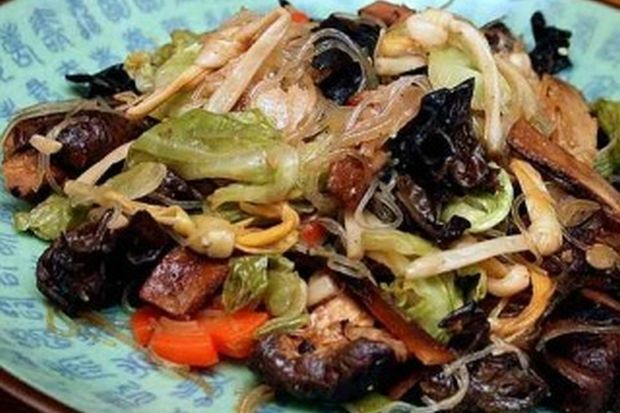 Rehydrate the black fungus and Shiitake mushroom, then drain. Reserve the soaking liquid. Trim off the mushroom stalks. Soak the glass noodles in water until soft. Drain. Heat the remaining cooking oil, and sauté the garlic until fragrant. Add the cabbage and carrot, and stir for about 10 seconds over high heat. Then, add the lily buds, mushroom and black fungus. Stir. Add the mushroom soaking liquid (about 1 cup), cover and simmer for three minutes. Then, add the glass noodles and the fried sweet bean curd strips. Stir fry for a minute more, and season to taste. Serve hot.